On Jan. 20, 2018, Turkey invaded Afrin, one of the three cantons of the Democratic Federation of Northern Syria, better known under its Kurdish name, Rojava. The invasion — conducted by a NATO army with the participation of Islamist militias — highlights the urgent need for solidarity with this beleaguered socialist experiment, whose survival could help to determine our own possibilities for a more democratic future. In the middle of a war zone, despite constant attack and a Turkish and Iraqi-Kurdish economic blockade which has cut off access to sufficient food, medical supplies, and electricity, the four million people of Rojava are trying to build a new kind of feminist democratic politics. 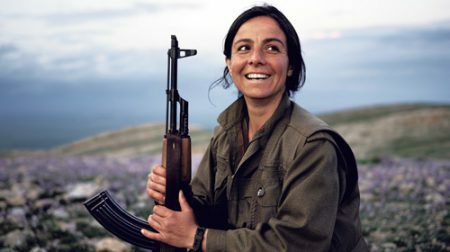 Rojava offers new ways of thinking and self-organization to a world where for decades the only two choices have seemed to be neoliberalism and violently hateful forms of nationalist fundamentalism. Rojava is not run by a state nor does it aspire to become one. In the writings of its jailed ideological leader Abdullah Ocalan, the state is seen as inimical to true democracy. So Rojava, which is the size of Massachusetts, is run by a bottom-up “self-administration,” built on a foundation of elected neighborhood committees called communes. Women’s liberation is central to both their ideology and practice; every organization and administrative bureau from the smallest commune to the committee that administers the whole region must have at least 40 percent women members and be led by co-chairs, one male and one female, while education on the importance of gender equality is mandatory in every institution. And all these organizations have parallel all-female counterparts. The economy being planned will be ecologically sustainable and based on cooperatives, though it is still very small because of the blockade and the constant state of war. 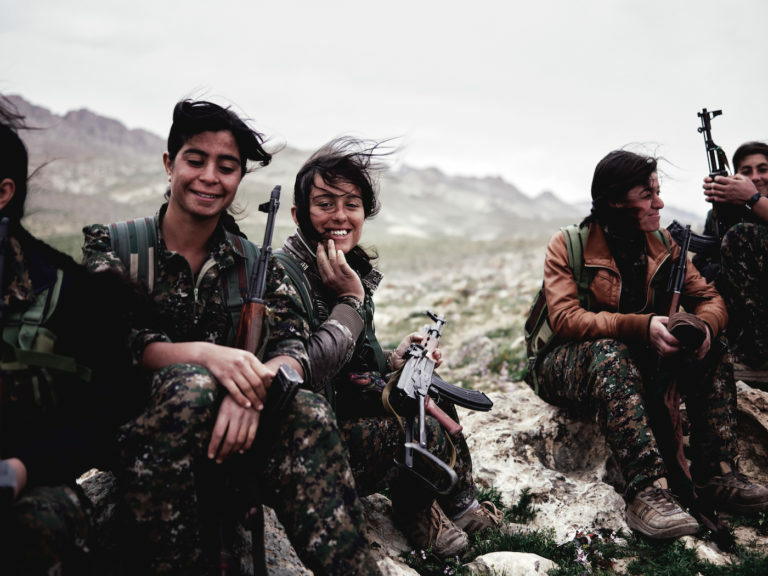 The rule of gender parity, parallel women’s organizations and joint leadership also applies to the army, the People’s Protection Units (YPG) and Women’s Protection Units (YPJ). In fact, the commander of the campaign to liberate Raqqa was led by a Kurdish woman seconded to the Syrian Democratic Forces (SDF), the joint Kurdish-Arab army that is part of the U.S. coalition against ISIS. The Kurds had no particular need to fight in Raqqa, which is Arab territory nowhere near Rojava, but they hoped their sacrifices would make the United States come to their aid if they were attacked by Turkey. Then Turkey attacked, and the United States did nothing. During the last six years, Afrin had become a safe haven for hundreds of thousands of war refugees from other parts of Syria. Without U.S. help, the YPG-YPJ had no air cover and could not hold out indefinitely against the technically advanced Turkish army and allied militias. Afrin fell on March 14. Fearing a bloodbath, the YPG-YPJ told all civilians to leave Afrin and head for Kobane. But the territory in between is controlled by the Assad government, which would not let many pass and thousands are still trapped outside on the road, in heavy rains, without food or medical attention. Those who tried to return to Afrin are being turned away by the Turkish army. Meanwhile, Turkish President, Tayyip Erdoğan, and his Syrian counterpart, Bashir Assad, seem to have done a deal to benefit both, in which Assad sends anti-government rebels from Ghouta and other areas near Damascus to faraway Afrin, where Turkey-sponsored militias give them homes and businesses stolen from the Kurds. Thus Assad gets rid of rebels close to his capital, Erdogan gets rid of some of the Kurds close to his border and the human rights of civilians on both sides are trampled. Civilians who did not leave Afrin have been subjected to even worse fates: kidnappings, confiscation of homes and property, the unexplained disappearance of up to 15 teenage girls and the imposition of sharia law enforced by ISIS-style burqua wearing enforcers. Erdogan clearly announced his plan to ethnically cleanse an area that has been Kurdish for centuries and replace the inhabitants of Afrin with more ethnically desirable refugees from other parts of Syria. Some of his paid militias are linked to al-Qaeda and Kurdish sources say that known members of ISIS have been incorporated into Turkey’s proxy army. Certainly, one of the first things the invaders did was knock down Yazidi shrines, a signature gesture when one remembers ISIS’s 2014 genocide of the Yazidis. Turkey must be isolated economically, diplomatically, and militarily until it withdraws its troops and its proxy militias from Kurdish Syria. In the long run, there can be no peace in the region until Turkey is willing to reopen negotiations with its own Kurds and grant all its citizens democratic rights, including freedom of expression and the right to form political parties and win elections without reprisals. To some U.S. progressives, it will seem counterintuitive to call on the U.S. government to support a socialist-feminist enclave. To others, the fact that the United States has given the Rojava Kurds military support (if only to use them for its own ends) shows they are sell-outs. Progressives today must put behind those narrow and static versions of anti-imperialism, dating from the Cold War period, and see that we live in a globalized world of constantly shifting alliances, where the same two countries can both contend and collaborate, and no single hegemonic power calls the tune for the world, no matter how much the United States would like to. Global politics today are shaped by an epic conflict between fundamentalist, tribalist forces like ISIS, Turkey, and others all over the world who want to go back into a theocratic Neverneverland inhabited by the ethnically or racially pure, versus the forces of what Ocalan calls “capitalist modernity,” or neoliberalism if you prefer, where the only values that count are listed on the U.S. Stock Exchange. Since the end of the Cold War, progressives have been searching for some alternative to both these worldviews, something new. Something we are still defining. The Kurds are working on their version of this in praxis; they call it democratic confederalism and see women as central to its development. Their experiment and the lessons we can learn from it are desperately important to all of us for the future. But we cannot learn from this experiment unless we help it survive. Defending Rojava is part of defending our own ability to imagine something new. Meredith Tax, a feminist writer and organizer, is the author of A Road Unforeseen: Women Fight the Islamic State and a cofounder of the Emergency Committee for Rojava, defendrojava.org. Members of the Kurdish Women’s Protection Units rest on a hillside in Rojava. Credit: Joey L.